Right image: A fresco of a young man from the Villa di Arianna, Stabiae, 1st century AD. While the traditional view of the ancient Roman artists is that they often borrowed from, and copied Greek precedents (much of the Greek sculptures known today are in the form of Roman marble copies), more recent analysis has indicated that Roman art is a highly creative pastiche relying heavily on Greek models but also encompassing Etruscan, native Italic, and even Egyptian visual culture. Stylistic eclecticism and practical application are the hallmarks of much Roman art. Pliny, Ancient Rome's most important historian concerning the arts, recorded that nearly all the forms of art – sculpture, landscape, portrait painting, even genre painting – were advanced in Greek times, and in some cases, more advanced than in Rome. Though very little remains of Greek wall art and portraiture, certainly Greek sculpture and vase painting bears this out. These forms were not likely surpassed by Roman artists in fineness of design or execution. As another example of the lost "Golden Age", he singled out Peiraikos, "whose artistry is surpassed by only a very few ... He painted barbershops and shoemakers’ stalls, donkeys, vegetables, and such, and for that reason came to be called the 'painter of vulgar subjects'; yet these works are altogether delightful, and they were sold at higher prices than the greatest paintings of many other artists.” The adjective "vulgar" is used here in its original meaning, which means "common". The high number of Roman copies of Greek art also speaks of the esteem Roman artists had for Greek art, and perhaps of its rarer and higher quality. 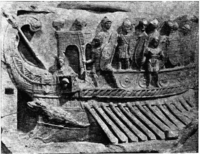 Many of the art forms and methods used by the Romans – such as high and low relief, free-standing sculpture, bronze casting, vase art, mosaic, cameo, coin art, fine jewelry and metalwork, funerary sculpture, perspective drawing, caricature, genre and portrait painting, landscape painting, architectural sculpture, and trompe l’oeil painting – all were developed or refined by Ancient Greek artists. One exception is the Roman bust, which did not include the shoulders. The traditional head-and-shoulders bust may have been an Etruscan or early Roman form. Virtually every artistic technique and method used by Renaissance artists 1,900 years later, had been demonstrated by Ancient Greek artists, with the notable exceptions of oil colors and mathematically accurate perspective. Where Greek artists were highly revered in their society, most Roman artists were anonymous and considered tradesmen. There is no recording, as in Ancient Greece, of the great masters of Roman art, and practically no signed works. Where Greeks worshiped the aesthetic qualities of great art, and wrote extensively on artistic theory, Roman art was more decorative and indicative of status and wealth, and apparently not the subject of scholars or philosophers. In the Christian era of the late Empire, from 350 to 500 CE, wall painting, mosaic ceiling and floor work, and funerary sculpture thrived, while full-sized sculpture in the round and panel painting died out, most likely for religious reasons. When Constantine moved the capital of the empire to Byzantium (renamed Constantinople), Roman art incorporated Eastern influences to produce the Byzantine style of the late empire. When Rome was sacked in the 5th century, artisans moved to and found work in the Eastern capital. The Church of Hagia Sophia in Constantinople employed nearly 10,000 workmen and artisans, in a final burst of Roman art under Emperor Justinian (527–565 CE), who also ordered the creation of the famous mosaics of Basilica of San Vitale in the city of Ravenna. Starting in the 3rd century CE and finishing by about 400 we have a large body of paintings from the Catacombs of Rome, by no means all Christian, showing the later continuation of the domestic decorative tradition in a version adapted - probably not greatly adapted - for use in burial chambers, in what was probably a rather humbler social milieu than the largest houses in Pompeii. Much of Nero's palace in Rome, the Domus Aurea, survived as grottos and gives us examples which we can be sure represent the very finest quality of wall-painting in its style, and which may well have represented significant innovation in style. 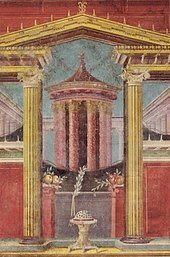 There are a number of other parts of painted rooms surviving from Rome and elsewhere, which somewhat help to fill in the gaps of our knowledge of wall-painting. From Roman Egypt there are a large number of what are known as Fayum mummy portraits, bust portraits on wood added to the outside of mummies by a Romanized middle class; despite their very distinct local character they are probably broadly representative of Roman style in painted portraits, which are otherwise entirely lost. Roman still life subjects are often placed in illusionist niches or shelves and depict a variety of everyday objects including fruit, live and dead animals, seafood, and shells. Examples of the theme of the glass jar filled with water were skillfully painted and later served as models for the same subject often painted during the Renaissance and Baroque periods. Fayum mummy portrait of a woman from Roman Egypt with a ringlet hairstyle. Royal Museum of Scotland. Gold glass, or gold sandwich glass, was a technique for fixing a layer of gold leaf with a design between two fused layers of glass, developed in Hellenistic glass and revived in the 3rd century AD. There are a very few large designs, including a very fine group of portraits from the 3rd century with added paint, but the great majority of the around 500 survivals are roundels that are the cut-off bottoms of wine cups or glasses used to mark and decorate graves in the Catacombs of Rome by pressing them into the mortar. They predominantly date from the 4th and 5th centuries. Most are Christian, though there are many pagan and a few Jewish examples. It is likely that they were originally given as gifts on marriage, or festive occasions such as New Year. Their iconography has been much studied, although artistically they are relatively unsophisticated. Their subjects are similar to the catacomb paintings, but with a difference balance including more portraiture. As time went on there was an increase in the depiction of saints. The same technique began to be used for gold tesserae for mosaics in the mid-1st century in Rome, and by the 5th century these had become the standard background for religious mosaics. The earlier group are "among the most vivid portraits to survive from Early Christian times. They stare out at us with an extraordinary stern and melancholy intensity", and represent the best surviving indications of what high quality Roman portraiture could achieve in paint. The Gennadios medallion in the Metropolitan Museum of Art in New York, is a fine example of an Alexandrian portrait on blue glass, using a rather more complex technique and naturalistic style than most Late Roman examples, including painting onto the gold to create shading, and with the Greek inscription showing local dialect features. He had perhaps been given or commissioned the piece to celebrate victory in a musical competition. One of the most famous Alexandrian-style portrait medallions, with an inscription in Egyptian Greek, was later mounted in an Early Medieval crux gemmata in Brescia, in the mistaken belief that it showed the pious empress and Gothic queen Galla Placida and her children; in fact the knot in the central figure's dress may mark a devotee of Isis. This is one of a group of 14 pieces dating to the 3rd century AD, all individualized secular portraits of high quality. 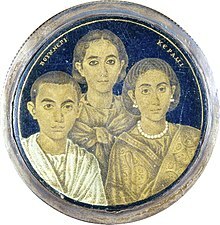 The inscription on the medallion is written in the Alexandrian dialect of Greek and hence most likely depicts a family from Roman Egypt. The medallion has also been compared to other works of contemporaneous Roman-Egyptian artwork, such as the Fayum mummy portraits. It is thought that the tiny detail of pieces such as these can only have been achieved using lenses. The later glasses from the catacombs have a level of portraiture that is rudimentary, with features, hairstyles and clothes all following stereotypical styles. A native Italian style can be seen in the tomb monuments of prosperous middle-class Romans, which very often featured portrait busts, and portraiture is arguably the main strength of Roman sculpture. There are no survivals from the tradition of masks of ancestors that were worn in processions at the funerals of the great families and otherwise displayed in the home, but many of the busts that survive must represent ancestral figures, perhaps from the large family tombs like the Tomb of the Scipios or the later mausolea outside the city. The famous bronze head supposedly of Lucius Junius Brutus is very variously dated, but taken as a very rare survival of Italic style under the Republic, in the preferred medium of bronze. Similarly stern and forceful heads are seen in the coins of the consuls, and in the Imperial period coins as well as busts sent around the Empire to be placed in the basilicas of provincial cities were the main visual form of imperial propaganda; even Londinium had a near-colossal statue of Nero, though far smaller than the 30-metre-high Colossus of Nero in Rome, now lost. The Tomb of Eurysaces the Baker, a successful freedman (c. 50-20 BC) has a frieze that is an unusually large example of the "plebeian" style. 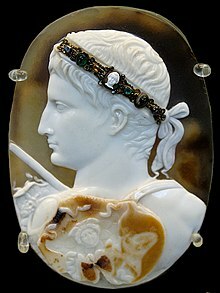 Imperial portraiture was initially Hellenized and highly idealized, as in the Blacas Cameo and other portraits of Augustus. Roman portraiture is characterized by its "warts and all" realism. Roman mosaic was a minor art, though often on a very large scale, until the very end of the period, when late-4th-century Christians began to use it for large religious images on walls in their new large churches; in earlier Roman art mosaic was mainly used for floors, curved ceilings, and inside and outside walls that were going to get wet. 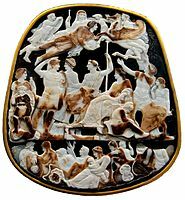 The famous copy of a Hellenistic painting in the Alexander Mosaic in Naples was originally placed in a floor in Pompeii; this is much higher quality work than most Roman mosaic, though very fine panels, often of still life subjects in small or micromosaic tesserae have also survived. The Romans distinguished between normal opus tessellatum with tesserae mostly over 4 mm across, which was laid down on site, and finer opus vermiculatum for small panels, which is thought to have been produced offsite in a workshop, and brought to the site as a finished panel. The latter was a Hellenistic genre which is found in Italy between about 100 BC and 100 AD. Most signed mosaics have Greek names, suggesting the artists remained mostly Greek, though probably often slaves trained up in workshops. The late 2nd century BC Nile mosaic of Palestrina is a very large example of the popular genre of Nilotic landscape, while the 4th century Gladiator Mosaic in Rome shows several large figures in combat. Orpheus mosaics, often very large, were another favourite subject for villas, with several ferocious animals tamed by Orpheus's playing music. In the transition to Byzantine art, hunting scenes tended to take over large animal scenes. It was in the area of architecture that Roman art produced its greatest innovations. Because the Roman Empire extended over so great of an area and included so many urbanized areas, Roman engineers developed methods for city building on a grand scale, including the use of concrete. Massive buildings like the Pantheon and the Colosseum could never have been constructed with previous materials and methods. Though concrete had been invented a thousand years earlier in the Near East, the Romans extended its use from fortifications to their most impressive buildings and monuments, capitalizing on the material's strength and low cost. The concrete core was covered with a plaster, brick, stone, or marble veneer, and decorative polychrome and gold-gilded sculpture was often added to produce a dazzling effect of power and wealth. ^ according to Ernst Gombrich. ^ a b Daniel Thomas Howells (2015). "A Catalogue of the Late Antique Gold Glass in the British Museum (PDF)." London: the British Museum (Arts and Humanities Research Council). Accessed 2 October 2016, p. 7: "Other important contributions to scholarship included the publication of an extensive summary of gold glass scholarship under the entry ‘Fonds de coupes’ in Fernand Cabrol and Henri Leclercq’s comprehensive Dictionnaire d’archéologie chrétienne et de liturgie in 1923. Leclercq updated Vopel’s catalogue, recording 512 gold glasses considered to be genuine, and developed a typological series consisting of eleven iconographic subjects: biblical subjects; Christ and the saints; various legends; inscriptions; pagan deities; secular subjects; male portraits; female portraits; portraits of couples and families; animals; and Jewish symbols. In a 1926 article devoted to the brushed technique gold glass known as the Brescia medallion (Pl. 1), Fernand de Mély challenged the deeply ingrained opinion of Garrucci and Vopel that all examples of brushed technique gold glass were in fact forgeries. The following year, de Mély’s hypothesis was supported and further elaborated upon in two articles by different scholars. A case for the Brescia medallion’s authenticity was argued for, not on the basis of its iconographic and orthographic similarity with pieces from Rome (a key reason for Garrucci’s dismissal), but instead for its close similarity to the Fayoum mummy portraits from Egypt. Indeed, this comparison was given further credence by Walter Crum’s assertion that the Greek inscription on the medallion was written in the Alexandrian dialect of Egypt. De Mély noted that the medallion and its inscription had been reported as early as 1725, far too early for the idiosyncrasies of Graeco-Egyptian word endings to have been understood by forgers." "Comparing the iconography of the Brescia medallion with other more closely dated objects from Egypt, Hayford Peirce then proposed that brushed technique medallions were produced in the early 3rd century, whilst de Mély himself advocated a more general 3rd-century date. With the authenticity of the medallion more firmly established, Joseph Breck was prepared to propose a late 3rd to early 4th century date for all of the brushed technique cobalt blue-backed portrait medallions, some of which also had Greek inscriptions in the Alexandrian dialect. Although considered genuine by the majority of scholars by this point, the unequivocal authenticity of these glasses was not fully established until 1941 when Gerhart Ladner discovered and published a photograph of one such medallion still in situ, where it remains to this day, impressed into the plaster sealing in an individual loculus in the Catacomb of Panfilo in Rome (Pl. 2). Shortly after in 1942, Morey used the phrase ‘brushed technique’ to categorize this gold glass type, the iconography being produced through a series of small incisions undertaken with a gem cutter’s precision and lending themselves to a chiaroscuro-like effect similar to that of a fine steel engraving simulating brush strokes." ^ Jás Elsner (2007). "The Changing Nature of Roman Art and the Art Historical Problem of Style," in Eva R. Hoffman (ed), Late Antique and Medieval Art of the Medieval World, 11-18. Oxford, Malden & Carlton: Blackwell Publishing. ISBN 978-1-4051-2071-5, p. 17, Figure 1.3 on p. 18. ^ Gazda, Elaine K. (1995). "Roman Sculpture and the Ethos of Emulation: Reconsidering Repetition". Harvard Studies in Classical Philology. Department of the Classics, Harvard University. 97 (Greece in Rome: Influence, Integration, Resistance): 121–156. doi:10.2307/311303. JSTOR 311303. According to traditional art-historical taxonomy, Roman sculpture is divided into a number of distinct categories--portraiture, historical relief, funerary reliefs, sarcophagi, and copies.